Paris: A new “bilateral road map” will help both UAE and France bolster existing and future ties for the mutual benefit of both countries, according to a joint communique issued on Friday. High-level talks between leaders of the two countries have opened up diverse prospects — across seven fields — ranging from education, economy and security to space, culture, environment and climate change. The reaffirmation of close ties was confirmed in the joint statement released after the November 21 visit to France of His Highness Shaikh Mohammad Bin Zayed Al Nahyan, Crown Prince of Abu Dhabi and Deputy Supreme Commander of the UAE Armed Forces, with President of the French Republic Emmanuel Macron. “The visit took place on the occasion of the Year of Zayed, commemorating the centennial of the birth of Shaikh Zayed, founding father and first President of the United Arab Emirates, was a new testimony of the strength of the historic partnership and ties between France and the UAE. “President Macron and Shaikh Mohammad held in-depth discussions on regional and international issues of common interest and priority, in particular the fight against terrorism and countering extremism,” the statement read. “The official visit enabled the French Republic and the UAE to take stock of the implementation of the bilateral road map agreed upon during the visit of President Macron to the UAE on November 2017 and to draw new prospects with a view of further enhancing the bilateral cooperation in the fields of education and francophone (I), culture and heritage (II), economy and investment (III), energy, environment and the fight against climate change (IV), space (V), regional peace and security, defence cooperation and the fight against terrorism and countering extremism and their supporters (VI) and political consultations (VII),” the statement read. 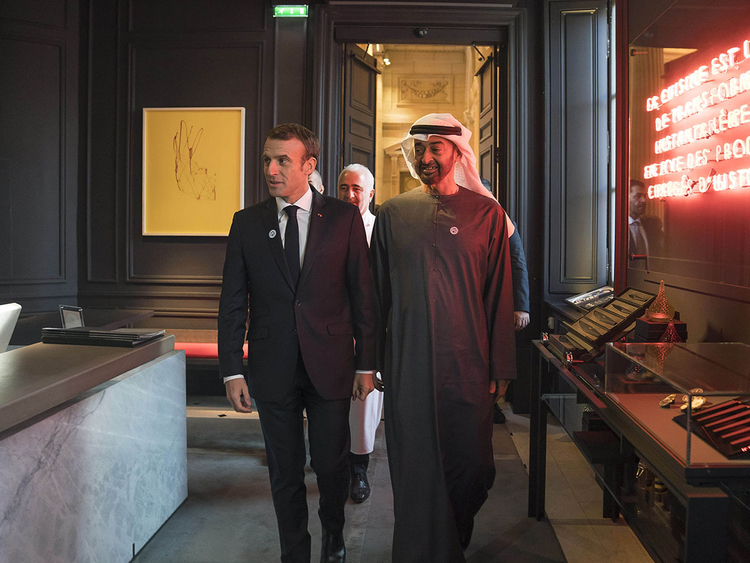 Some of the numerous highlights stemming from the joint communique signalled a reinforcement of existing important links between the two countries such as the Louvre Abu Dhabi and forward-looking new plans to take the joint UAE-France friendship to new levels of cultural understanding. Shaikh Mohammad during his Paris trip visited the Shaikh Zayed Centre at the Louvre. On this occasion, both parties praised the success of the Louvre Abu Dhabi, one year after its opening, and the ongoing cooperation for the programming of new temporary exhibitions and coordination of loans from French collections. Further cultural collaborations include the upcoming project of launching a francophone radio service in order to further promote French and francophone culture and the French language in the UAE. Both parties welcomed the recent developments in regards to the French participation at the Dubai World Expo in 2020, in accordance with the contract signed on November 9, 2017 by Reem Ebrahim Al Hashemi, Minister of State for International Cooperation, and Director-General of Expo 2020 DubaiBureau, and Erik Linquier, France’s Commissary General for Expo 2020 Dubai. Shaikh Mohammad also held a working session with French Prime Minister Edouard Philippe and several CEOs of French companies, in view of exploring the ways to enhance economic cooperation, strengthen bilateral trade and encourage joint-investment projects, both in France and in the UAE. • Both parties welcomed, in this context, the signing of the bilateral agreement in Abu Dhabi on July 26, 2018 on the reintroduction of French language teaching in 10 state schools in the UAE in its initial phase and the nomination of a French expert to coordinate with the UAE Ministry of Education on the implementation of this program. • Paris Hospital Foundations and the American Hospital of Paris each signed agreements with the Department of Health of the UAE to set the conditions under which the French party shall provide medical services to Emirati patients. • France welcomed the perspective of the Special Olympics in Abu Dhabi in 2019, in which France intends to participate with a delegation of more than one hundred athletes. • Both countries jointly reaffirm their commitment to intercultural dialogue and their willingness to promote values of tolerance through cultural, artistic and institutional cooperation. To that end, both parties have decided to organise a French-UAE crossed season in 2021, to celebrate the fiftieth anniversary, Golden Jubilee of the UAE through a series of events in France and in the UAE all along the year. • Both entities are also in the process of agreeing the extension of the existing co-investment program (Franco Emirati Fund) with additional €700 million (Dh2.9 billion). The co-investment programme was created in 2014 and has already committed more than €300 million to support the development of French companies with a proven growth potential through long-term investments in health care, education, elderly care, real estate and affinity insurance. • Both countries jointly reaffirm their support to energy transition and green economy initiatives and agreed to develop joint projects in the field of renewable energies and climate change adaptation and mitigation, in particular on the potential applications of Artificial Intelligence and satellite observation in these fields. • France congratulates the United Arab Emirates on the successful launch, on October 29, 2018, of Khalifasat, the first high resolution Earth Observation satellite entirely manufactured in the UAE by Emirati engineers. • France and the United Arab Emirates welcome the substantial progress of their space cooperation and, in particular, between the Centre National d’Etudes Spatiales (CNES) and the United Arab Emirates Space Agency (UAESA). • In the fields of regional peace and security, defence cooperation and the fight against terrorism and countering extremism: Regarding Yemen, they reaffirm their support to the efforts of UNSG Special Envoy Martin Griffiths especially his efforts to hold the next round of discussions in Stockholm later this year. They reiterate their support for a sustained political solution for Yemen and re-emphasise the importance of all relevant Security Council resolutions, including UNSC 2216, the GCC Initiative, and the Yemeni Dialogue. Both parties reaffirm their support for a fair, lasting and comprehensive solution to the Israeli-Palestinian conflict. They express their concerns towards the evolution of the situation on the ground, in particular tensions in the Gaza Strip and development of the settlements which undermine the two-state solution. They recall that the only way to reach a lasting peace is through a negotiated solution leading to two states, Israel and Palestine, living side by side, in peace and security with Jerusalem as a capital. They recall the importance of the Arab peace initiative. • Both parties praise the ongoing intense and fruitful cooperation in the field of security and defence on the occasion of the 10th anniversary of the establishment of the French Air Force base in Al Dhafra on 1 October 2008, and in the perspective of the upcoming 10th anniversary of the establishment of the French naval base in Abu Dhabi on 26 May 2009.